As you will see in the next post, I think Planet Nine is really out there. But that doesn’t mean you should think it is out there. You might be skeptical. In fact, I would prefer that you were skeptical. I would prefer that you read the scientific paper, looking for potential flaws, caveats, and places where we might have been led astray. But, OK, I understand that the actual scientific paper is on the weighty side, so, rather than make you wade through it finding the potential piutfalls, instead, I will give you my top list of things that might be wrong. First, though: what is not wrong. If there is an approximately 10 Earth mass planet on an extremely elliptical orbit in the outer solar system, it would definitely line up the orbits of Kuiper belt objects with similarly elongated orbits, it would create Kuiper belt objects with orbits twisted by 90 degrees to the planets of the solar system, and it would make objects, like Sedna, which have elongated orbits which don’t ever come close to the rest of the Kuiper belt. These effects we now know from a general mathematical analysis and from detailed computer simulations to double-check the mathematical analysis. This analysis, I am confident to say, is iron-clad. Astronomers will try to reproduce it (I hope), and they will get the same results (I know). There truly is no wiggle room here. A 10 Earth mass planet does exactly all of the things that we are trying to explain. If I am so confident of this, how could Planet Nine possibly not exist? Just because Planet Nine can explain all of these effects, it doesn’t not mean that there is no other possible explanation. We tried to think of everything that we could, and systematically ruled out alternatives, but that doesn’t mean that someone else won’t come up with an idea that works. Again, I hope that there are skeptical astronomers working right now to come up with alternatives. I am confident that they will not come up with them (because I do actually think we considered everything that could possibly be out there), but, unlike my statement above, I will definitely not say that this one is iron-clad. Aluminum-clad, maybe. Stainless steel, perhaps. I’d be willing to bet a lot of money against the idea that someone will find an alternative explanation for all of the effects that we are seeing. 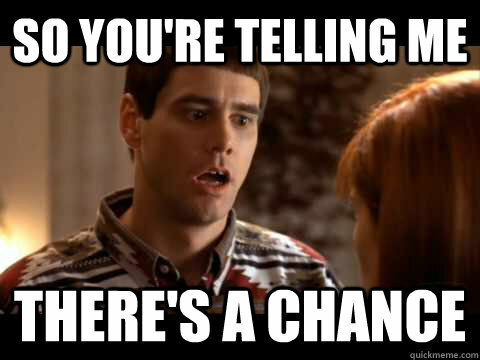 But it is possible I could lose. In our analysis, we show that the six most distant objects that have orbits extending outward from the Kuiper belt all line up within a 100 degree quadrant and all have orbital planes which are tilted away from the plane of the planets by about 20 degrees (and within 6 degrees of each other). From some very simple calculations we can show that the probability of these alignments happening due to chance is only about 0.007%. You could also say that there is a 99.993% chance that the alignments we are seeing in the outer solar system are real, and that we are not simply being fooled into seeing a pattern where none exists. But, really, if you said that, you’d be wrong. Real statistics don’t work that way. You can’t, for example, flip 100 coins, realize that 10 of them in the far upper right corner all turned up heads and then say “wow; the chances of 10 heads in the far upper right corner is only one in 1024 so something must be happening up there.” And if you flipped all of the coins again, chances are you wouldn’t get 10 heads in the far upper right corner (in fact, chances are 1 in 1024). The real statistical question that you should be asking at the first coin flip is more like “what is the probability that something that seems anomalous will appear just due to chance?” That question is essentially impossible to answer, because it relies on knowing what a human who is looking for anomalous patterns would call anomalous. There are two good ways to combat these sorts of flawed statistics. The first I just mentioned above: replicate the experiment and look for the same result. Your eye and brain might pick out a random pattern from the noise one time, but the same pattern will not occur again. You might see different patterns, but that just shows you how easy it is to find patterns in data. How do we replicate the finding that the most distant objects in the outer solar system are unusually aligned? We find more of them. If the alignment was just random pattern finding by easily fooled humans, it will quickly go away when the next half dozen objects are discovered. And while it took 12 years to discover the first 6 aligned objects, the next few should be much faster, as telescopes and surveys continue to get bigger and more powerful. One caveat: our computer simulations do not predict that 100% of the most distant objects will be clustered. Just the vast majority. So finding one or two outside of the cluster is not the end of Planet Nine. 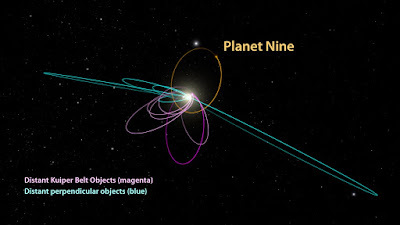 But finding the next six objects randomly distributed around the sky would be a pretty clear indication that we fell into the pattern-matching trap and that Planet Nine is a fantasy. The Planet Nine hypothesis makes strong predictions, and these can be used to show that the hypothesis is wrong, if it is. The second way to combat the flawed statistics of pattern matching is to use your explanation for the pattern that you see to predict something entirely unrelated to the pattern. In our example of the coins above, you could hypothesize that the explanation for all of the coins coming up heads in one spot on the table is that there is a powerful magnetic field in that one location of the table (ok, I’m not sure how that could make things come up all heads, but work with me on this one). You could then make predictions. Perhaps you would predict that a set of ball bearings placed on the table would systematically roll towards that location. Or something. The key is that the prediction is something that you don’t know the answer to ahead of time, is not directly related to your original observation, and has a low probability of occurring on its own. Here you are not replicating the experiment but are instead performing a different experiment and predicting a very specific answer. Our hypothesis passed this test with flying colors – in my opinion – with the prediction and subsequent realization of the existence of what we call the distant twisted orbits (maybe we need a better term for these; definitely we need a better term for these). But maybe it’s all just a bigger case of pattern matching? Such an explanation begins to get unlikely, but now we have a second set of objects that can be replicated, and we’ll all be watching the results come in. There is one other more mundane in which we can be “wrong.” Given the small number of objects and our, currently, limited number of computer simulations (“limited” here still means ~6 months of super computer time, but we haven’t had time to precisely explore all of the possible parameters of Planet Nine), it is possible that our estimates are not precisely correct. Maybe Planet Nine js 20 times the mass of the Earth instead of 10. Maybe it is actually a giant terrestrial planet instead of a small gas giant. Maybe it is slightly further away or tilted into a slightly different plane. These tweaks are OK. We would still say that the Planet Nine hypothesis is correct. If, however, a planet is found beyond Neptune and it is totally different from what we have described, if it exists, but it fails to cause the basic gravitational interactions that we have discussed, then, quite simply, we are wrong. We are not predicting that there is some planet beyond Neptune, we are predicting that there is this planet beyond Neptune and it is causing these effects on the outer solar sytem. Standing up in public and claiming that you have found evidence for a new planet in the solar system almost certainly means that you are about to join a century-long list of people who have been wrong. I mean, look, le Verrier and Adams did it in 1846 when they predicted the existence of Neptune, sure, but since then there have been dozens (hundreds?) of similar claims (including le Verrier himself, who thought he had found a Planet Vulcan inside the orbit of Mercury) which have all lead to absolutely nothing. For most of the 160 years, astronomers tried to use the positions of the planets themselves to infer the existence of another planet (amusingly: it was the search for this alleged planet that led to the inadvertent discovery of Pluto, which is why the New York Times headline on the day of the Pluto announcement suggests that the planet might be bigger than Jupiter, which it is not). This idea was finally put to rest in 1993, when a careful analysis of modern data showed that all of the planets are exactly where they are supposed to be (links to papers here may lead to irritating pay walls, but you can at least read the abstracts, I think). When it was clear that the planets were where they were supposed to be, astronomers moved on to the comets, which traverse the regions where Planet X might be, and could be effected by them. A suggestions was made that Planet X causes comet showers and modulates the positions of incoming comets, but these suggestions have rarely been given much credibility when more detailed analyses are performed. The idea of trying to detect Planet X by its gravitational effects was re-picked up soon after the discovery of the Kuiper belt. Early on, astronomers proposed a Mars-like planet at ~60 AU to explain an apparently abrupt outer edge to the Kuiper belt, but then quickly ruled it out. But the idea kept floating around, and many papers suggested some sort of variant. Things began to get interesting with the discovery of Sedna, which was the first object discovered in the solar system whose orbit could only be explained by interaction with something besides the known planets (I have a whole series on this over on my blog. Also, now I know how to end the series). In the discovery paper, I suggested, among other possibilities, a new planet. But a ~Earth sized one around 70 AU. Really, though, for the past 12 years I have been convinced that Sedna's strange orbit is a left over relic from the formation of the sun in a cluster of stars 4.5 billion years ago. Others suggested a ~Mars mass planet a little further out as the culprit, or even a planet that was once in the outer solar system, but is now gone. Planets are popular things to propose when you see some gravitational effect that you cannot otherwise explain. After Sedna, the most interesting developments in the Planet-X-ology came from two papers over the past few years. 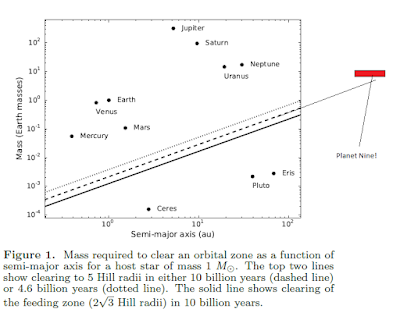 First, Chad Trujillo and Scott Sheppard noted some unusual orbital alignments among distant Kuiper belt objects (arguments of perihelion appeared clustered around zero, to be specific). They proposed a ~2 earth mass planet at a few hundred AU organizing these objects through a mechanism called a Kozai resonance, though they pointed out in their own paper that they couldn't make the idea work out. And detailed simulations showed that their proposed planet did not have the hoped for effect and thus could not be real. Once again. Though this time, critically, the data looked good, just not the explanation. A more recent study also had important clues about Planet Nine. In September, Rodney Gomes and colleagues proposed that an entirely separate set of objects were being influenced by some sort of distant planet. While they were not able to use the observations to say much about the planet, they concluded that it was likely that these objects were being pushed around by something large and far away. So by this last September, then, if you were paying extremely close attention, you might have been clued in that something was going on in the outer solar system and that a large planet might well be a good explanation, but no one could figure out exactly what was going on. Was there some way to connect Sedna, the strange alignments of Trujillo and Sheppard, and the distant objects of Gomes et al? This moment reminds me of the time right after the discovery of Uranus. In 1783, Anders Johan Lexell published the first calculation of the orbit of Uranus (proving that it was on an elliptical, rather than parabolic orbit, and thus not a comet). Lexell found that, while the orbit of Uranus was elliptical, it also appears to be being perturbed by an external body, presumably a planet. More detailed calculations of the orbit of Uranus in 1821 by Alexis Bouvard confirmed the orbital irregularities and reinforced the idea that there must be an eighth planet out there. These calculation are the ones that led Adams and le Verrier to separately try to see if they could figure out not just if there was a planet out there, but where there was a planet. This point is where Konstantin and I started. We could tell that the data from Trujillo and Sheppard was right: something was happening in the outer solar system, but no one could quite figure out what (the paper by Gomes et al. hadn't been published yet, but would eventually be a critical part of the story). We quickly re-confirmed that the Kozai resonance hypothesis of Trujillo and Sheppard didn't work, so what was it? At this point you can read Konstantin's account of how we got to the answer. Are we right this time? After all of these years? We think so. The data are good, the understanding of how the gravitational forces push everything around is good. We think that, this time, we've actually identified something real out there. We're confident enough to stand up in public and say that we think we have found evidence for a new planet in the solar system. 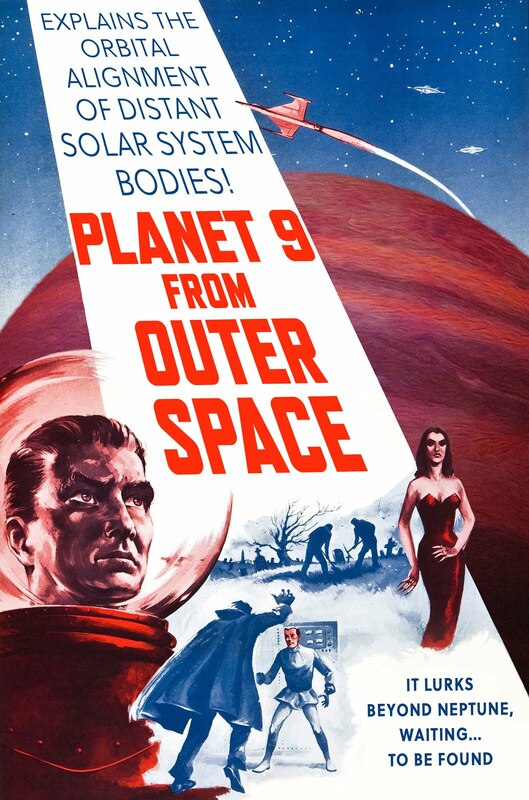 And we think it is time to retire the long and winding history of Planet X, and start anew with Planet Nine. There is an uneasy exhilaration in announcing that the solar system might contain a dim, massive, and as-yet unseen planet. Certainly, nearly every attempt to predict the existence of a “Planet X” has ended in failure, but history does contain one shining success. LeVerrier and Adams’ theoretical predictions of the existence of Neptune, based on observed irregularities in Uranus’ orbit, are hailed as one of the all-time success stories of astronomy. And as history shows, the issues with post-1846 claims of Planet X have had more to do with erroneous interpretation of the observational data, than anything else. In other words, every time the observations seemed to call for an introduction of a putative additional planet, further analysis has revealed that the apparent anomalies could be fully reconciled within the framework of the known solar system. Remarkably, the solar system in 2016 tells a very different story. Beginning with the 2003 detection of Sedna (a discovery I remember learning about from a guy cautiously trying to hide his lit cigarette in his backpack during high school lunch break), it has been clear that the solar system still has some tricks up its sleeve. Unlike the rest of the Kuiper belt, Sedna traces out an orbit whose origin cannot be explained by perturbations from the known giant planets alone. And while Sedna’s isolated orbit could in principle be attributed to a dynamical perturbation that occurred during the solar system’s infancy, the 2014 paper by Trujillo and Sheppard demonstrated that there is in fact, much more to the story. It was with this very paper in hand, and a facial expression showing a combination of excitement and concern, that Mike Brown walked into my office a year and a half ago. 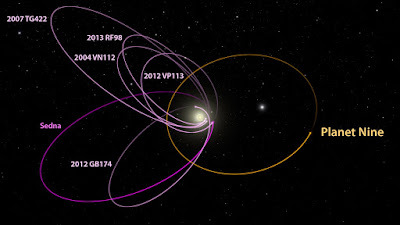 Prompted by their discovery of 2012 VP113, a second object residing on a Sedna-type orbit, Trujillo and Sheppard pointed out that all Kuiper belt objects with orbits that do not veer into inter-planetary space and spend longer than approximately 2000 years to complete a single revolution around the Sun, tend to cluster in the argument of perihelion. As it turns out, this clustering represents only a part of the full picture. A closer look at the data shows that six objects that occupy the most expansive orbits in the Kuiper belt (including Sedna and 2012 VP113) trace out elliptical paths that point into approximately the same direction in physical space, and lie in approximately the same plane. Mike and I were genuinely perplexed. Could the confinement of the orbits be due to an observational bias or a mere coincidence (after all, we are talking about six objects here - not exactly “big data”)? Thankfully, the probability of the observed alignment being fortuitous can be assessed in a statistically rigorous manner, and clocks in at right around 0.007%. Not a great gamble. Moreover, application of simple perturbation theory (or direct numerical integration) demonstrates that if allowed to evolve under the gravitational influence of Jupiter, Saturn, Uranus and Neptune, the orbits would become randomly oriented on timescales much shorter than than the multi-billion year lifetime of the solar system. So the dynamical origin of the peculiar structure of the Kuiper belt cannot be outsourced to the distant past - something is holding the orbits together right now. Our progress was initially anything but rapid. Coming from observational and theoretical backgrounds respectively, Mike and I don’t always speak the same language, and would spend hours arguing profusely, only to later realize that we are in fact, saying the exact same thing. Then there were all the ideas that did not pan out. Ideas crowding out our outtakes reel range from models where the self-gravity of the Kuiper belt itself keeps the observed structure intact (see a recent paper by Madigan & McCourt on this topic) to a scenario where the orbit of a distant planet cradles the orbits of Kuiper belt objects from the outside, maintaining the same average orientation. Each hypothesis failed when confronted with the data. Last summer brought our first glimpse of hope. Through a series of numerical experiments (wherein an initially axisymmetric disk of planetesimals occupying eccentric, Neptune-hugging orbits, was allowed to evolve under the gravitational influence of a distant perturber) we began to note that planetesimal swarms could be sculpted into collinear groups of spatially confined orbits by “Planet Nine". Intriguingly, this would only occur if Planet Nine was chosen to be substantially more massive than the Earth, and to reside on a highly eccentric orbit. 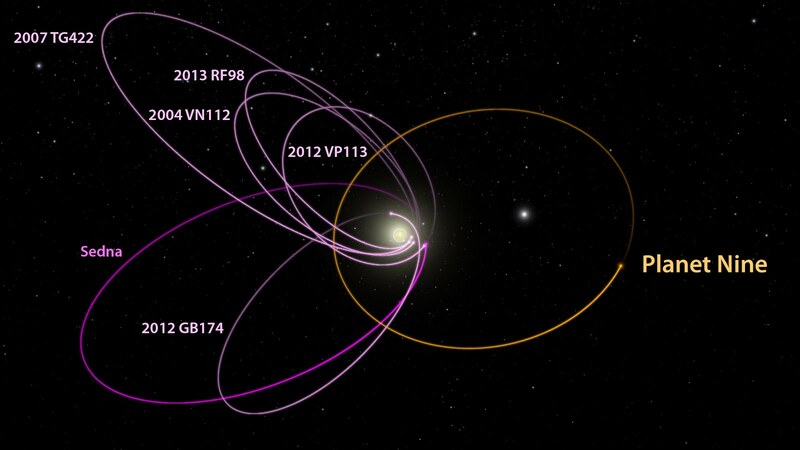 More unexpectedly, the confined orbits would cluster in a configuration where the long axes of their obits are anti-aligned with respect to Planet Nine, signaling that the dynamical mechanism at play is resonant in nature. Surprising and unforeseen results suddenly began to accrue. Upon a cursory examination of the simulation data, we noticed that gravitational torques exerted onto the Kuiper belt by Planet Nine would induce long-period oscillations in the perihelion distances of the confined KBOs. This naturally generated detached orbits, such as those of Sedna and 2012 VP113. Moreover, the evolutionary calculations suggested that if we were to revisit the Kuiper belt in a hundred million years, objects like Sedna and VP would look like conventional garden variety KBOs, while some of the more typical objects would acquire detached orbits. And finally, there was a weird, crazy twist. Even in simulations where Planet Nine was chosen to reside in approximately the same plane as the rest of the solar system, the model consistently generated orbits that are nearly perpendicular with respect to the nominal plane of the Kuiper belt. Imagine our surprise when we realized that such a population of objects actually exists! (See also this paper by Gomes et al) Ultimately, some additional effort is needed to understand the process by which KBOs acquire perpendicular orbits, but our bets are placed onto the Kozai effect inside mean-motion resonances. In the end, our model ties together three elusive aspects of the Kuiper belt (namely, physical alignment of the distant orbits, generation of detached objects such as Sedna and the existence of a population tracing our perpendicular orbital trajectories) into a single, unifying picture. As a dynamical model, this appears compelling. But it is simultaneously important to keep in mind that until Planet Nine is caught on camera, it remains a theoretical prediction. In the mean time, however, we hope that our calculations trigger an observational hunt for Planet Nine, and we will one day wake up to learn that solar photons that have reflected off of planet nine’s frigid surface, have landed onto the aperture of a terrestrial telescope. 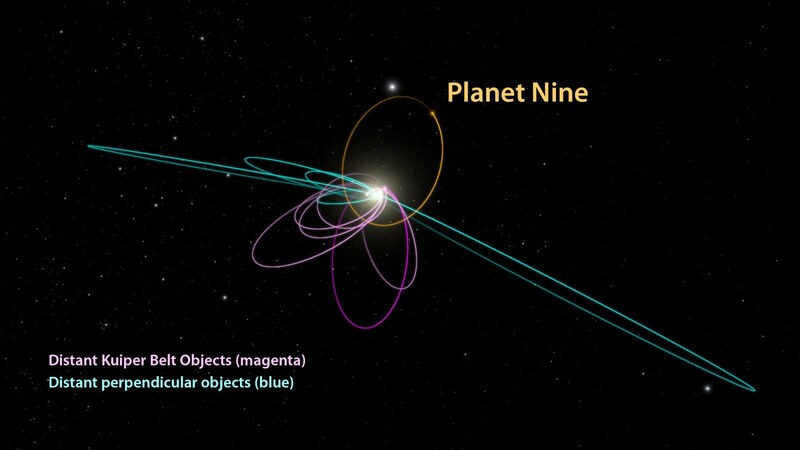 Is Planet Nine a "planet"? In 2006, when the International Astronomical Union codified what we mean when we say the word "planet," I was quoted multiple times saying something like, "That's it. That's the end of planets. We get eight in this solar system and that will have to be enough. Since 1845 there have been no new ones to discover." We think that Planet Nine is between 5 to 10 times the mass of the Earth (some evidence that we are continuing to examine suggests that it might even be closer to 20 times the mass of the Earth; Konstantin is optimistic; I'm skeptical; such tensions are what keep collaborations like ours honest). That puts it at a little smaller than Neptune. But is it a planet? The IAU definition of planet includes the clunky phrase that it has to "clear its orbit." Really, this phrase is just an attempt to explain the concept that planets are the gravitational dominant things of planetary system and that one of the ways they display their gravitational dominance is by pushing around everything in their path. Overly literal critics of the IAU definition will insist that because Jupiter has asteroids which co-orbit with it (the Jupiter Trojans) that Jupiter is not a plane by this definition, etc. etc., but that is simply a problem with the clunkiness of the statement of the definition, not of the underlying concept. Is Planet Nine gravitationally dominant? I think it is safe to say that any planet whose existence is inferred by its gravitational effects on a huge area of the solar system is gravitationally dominant. If that is not good enough for you, though, astronomer Jean-Luc Margot at UCLA has recently written a nice paper finally quantifying what the phrase "clear its orbit" really means. To clear an orbit, an object has to be a certain size, given its distance. 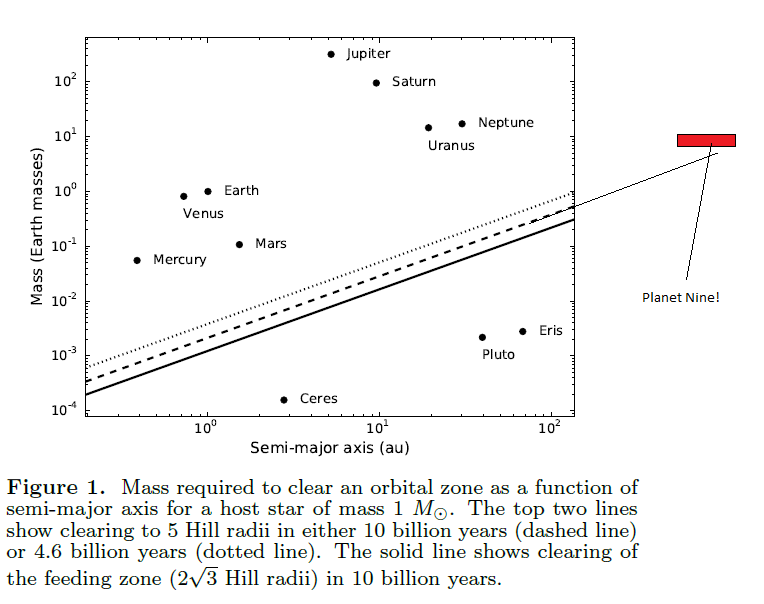 I've taken the key figure from his paper, which shows the planets of the solar system and compares them to the "planet" criterion (note that all of the planets are well above the planet line, while the 3 dwarf planets are well below it; this wide separation between planets and dwarf planets is another indicator of how solid the concept of gravitational dominance in the solar system is). If we extend this figure out to the distance and mass of Planet Nine, we find that it, too, is above the planet line for all of our considered cases. (technical note: Margot has several different criteria for clearing; we prefer the "clear the feeding zone in 4.5 billion years" criterion, which is the line that we have extended). 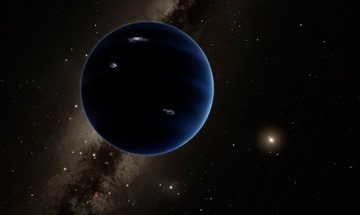 For for much of the predicted range and size of Planet Nine it is comfortably above the line, at its most distant possible orbit and its smallest possible mass, Planet Nine just barely scrapes by as a planet by this calculation. However, we believe that if it really is on the most distant of possible orbits it is probably on the more massive side. Why? Because if it is going to have the effects that we have seen, it needs to be even more massive if it is further away. In short: no matter where it is, the one thing we know for sure about Planet Nine is that it is dominating the outer edge of the solar system. That is enough to make it a planet by anyone's calculation.